No code needed. Click the button to redeem your discount at nemacolin.com. Ongoing deal, never expires. Last validated 1y ago . Used 287 times. 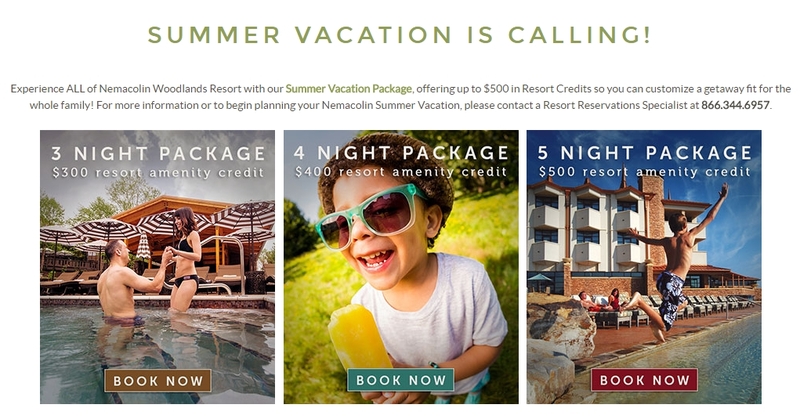 Mark Factoran Experience all of Nemacolin Woodlands Resort with our Summer Vacation Package, offering up to $500 in Resort Credits so you can customize a getaway fit for the whole family. Resort credits cannot be used towards lodging, tax or resort fee. This offer cannot be combined with any other offer or promotion. Not available to groups, conventions or existing reservations. Resort Credits cannot be exchanged for cash. No refund or credit given for the unused portion of Resort Credits. A $35 Resort Fee per room, per night is required.